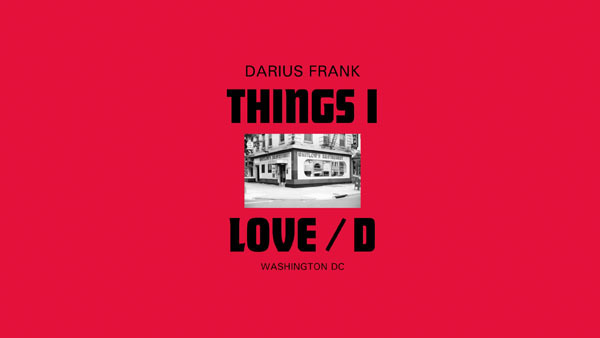 BOMBAY SAPPHIRE Gin announced DC-based emerging artist Darius Frank’s first public art project Darius Frank: Things I Love/d. The exhibition will be free and open to the public at Dock 5 in Union Market in the artist’s hometown of Washington, DC on Saturday, July 29 and Sunday, July 30, 2017 from 12PM to 6PM. The project was developed in collaboration withNY-based public art nonprofit Creative Time for the BOMBAY SAPPHIRE Artisan Series, an annual competition committed to discovering the next big name in visual arts. The organization acted as an advisor to Frank on producing a public work of art in a medium that is new to the artist. The exhibition was commissioned as part of 7th Annual BOMBAY SAPPHIRE Artisan Series national grand prize, which Frank was awarded in December 2016. 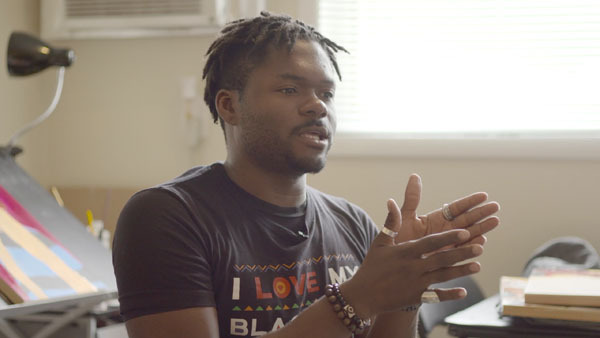 Resident sat down with him to discuss his career as an emerging artist and a little bit about this exciting new project and what inspires him. Whenever I am asked this question, the first thing I think about is a quote from Chuck Close; “Inspiration Is for Amateurs—The Rest of Us Just Show Up and Get to Work.” I think about it because in college, it meant everything to me. With that said though, I learned that everyone is inspired, whether you wait around for it or not. I am inspired by life, people, places, smells, feels, colors, and things. I am literally inspired by being alive. It shows in my work when you look at the detail and work invested in not only the figures, but the items in the scene… a wrinkle in a shirt, to a highlight on a couch arm. 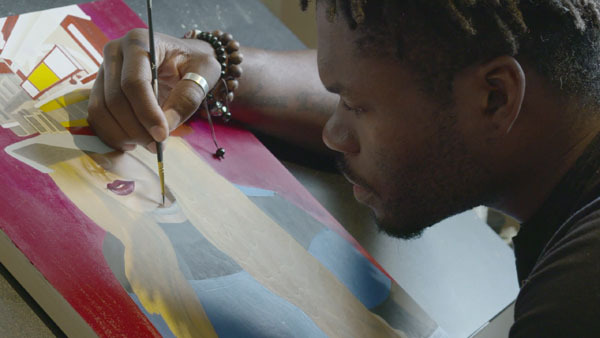 The “Things I Love/d” project for Bombay Sapphire’s Artisan Series is focused on showcasing the similarities in feelings between the people who are from or grew up in Washington DC, to the people that are new to DC. It’s an attempt to bridge a gap and bring awareness to the ever-changing landscape that is DC. Mostly in hopes to better serve the vision of DC moving forward – I want people to invest in people. Ultimately, we’re all we’ve got, and we’re not doing right by each right now. I figure I would start with the city I grew up in, around, and loving. It was a no brainer, literally. As I stated, I grew up in and around DC. I have heard the stories, I have lived the experiences, I have ran the streets and hid from them. I spent years listening to my dad’s stories and it started out as a way to lament through imagery on DC like my dad does through his stories. The concept grew and took shape by collaborating with Creative Time for Bombay Sapphire’s Artisan Series grand prize win. I give thanks to all parties that helped make this project what it is. How did you feel working with Creative Time and Bombay Sapphire? This is obviously a great achievement and your first solo exhibition. Must be exciting. Of course it has been amazing. I show my work during Miami Art Week at the Artisan Series finale was one of my lifetime goals. After that, the rest is bonus, and this bonus has been one hell of a ride. I am a bit rattled at times by the scope and amount of work that goes into something like this project; but I truly wouldn’t trade it in for anything. It has been AMAZING. When it comes to style, it would have to be the work of Barkley Hendricks. I think the classical period I most reach back to would have to be the Renaissance period. More for the idea of enlightenment, and how they put things into the works, symbolically. As a black man, I pursue telling stories that relate most closely to me and of those I have grown up around. So though my work spans racially, it does tend to skew more black, and the narratives lean more toward the idea of strength or agency. Most of my work is about owning oneself. So I play with the scene, add and take away, to distract while forcing the viewer to realize the figure in the space. Professionally, I am hoping to mean something to an artistic timeline. Understanding that artists aren’t revered as they once were, I work hard to offer work and perspective that outlasts me, the generation next, and the generation after that. I am more chasing forever than I am hoping to impact now. Yes, I want my work to be viewed and help with healing, having a good time, getting through a time, etc. Larger view though, I want my work to mean something, to someone, until all is lost. How did you find your passion for art, or when did you discover your talent? I found my passion sitting under my dad’s drawing table as a young child. At age four I would hide and trace as he drew images of warrior women and revenge vixens above. At around 8 or 9, my dad challenged me and my brother to draw heroes, and then he would draw them bigger and better for our room. That was the day I knew I had a talent. I spent days impressing in grade school with the talent, and picked up painting during college as an outlet from all the business training. In cultivating the painting and already having the ability to draw, I am here now really just blessed to keep it going. Being able to say “professionally” is new to me. That’s one of the cooler developments outside of my Artisan Series win. Maybe the Smithsonian, MOCA, or the Louvre next?